Why should members take on the Challenge? Take on the Waste Challenge!? Global Green and Healthy Hospitals is challenging members around the world to take on measurable actions to reduce the amount and toxicity of waste produced, while implementing the most environmentally sound waste management and disposal options. Why Should Members Take on this Challenge? Each and every hospital, large and small, rural and urban, can have a positive impact on the public and environmental health of their community through sustainable health care waste management. By reducing and segregating health care waste, health care facilities can reduce their operational costs, enhance community relations and even generate revenue. Together, as a collective, Waste Challenge participants from around the globe form a powerful, leading voice and example for the global health sector to follow. Level 1: Achieve or exceed at least two of the Level 1 goals. Level 2: Achieve or exceed at least two of the Level 2 goals. Level 3: Achieve or exceed at least three of the Level 3 goals. Ultimate target: Meet or exceed four more of the ultimate targets. Download the Waste Challenge Information Pack for in depth information and details on the challenge and how your institution can participate. Scientists have estimated that over half of the world’s population is at risk from environmental, occupational, or public health threats deriving from improperly treated health care waste. As centers of healing whose priority is to first, do no harm, preventing these risks to their community and environment is imperative for health care facilities. 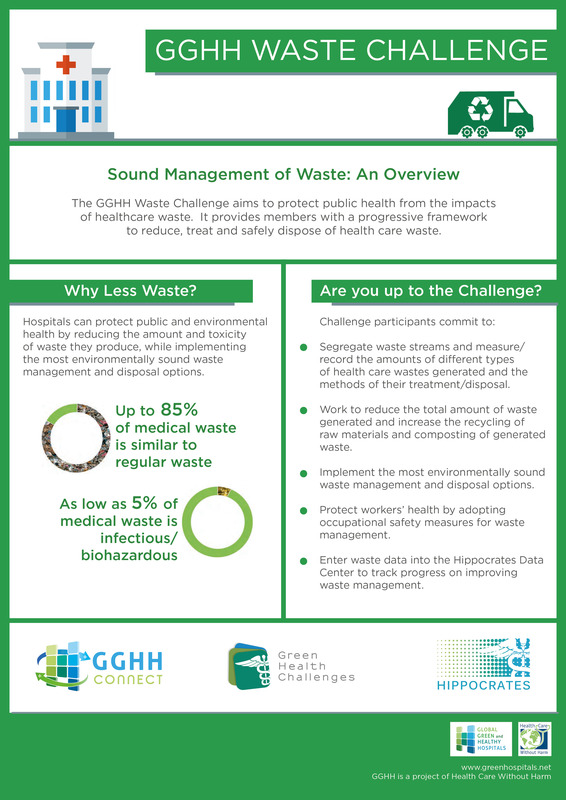 Aligning with UN Sustainable Development Goal #12 to “Ensure sustainable consumption and production patterns, the GGHH Waste Challenge provides a progressive framework for the global health sector to reduce, treat, and safely dispose of health care waste.